“Cat” Catalia Fisa lives disguised as a soothsayer in a traveling circus. She is perfectly content avoiding the danger and destiny the Gods—and her homicidal mother—have saddled her with. That is, until Griffin, an ambitious warlord from the magic-deprived south, fixes her with his steely gaze and upsets her illusion of safety forever. Griffin knows Cat is the Kingmaker, the woman who divines the truth through lies. He wants her as a powerful weapon for his newly conquered realm—until he realizes he wants her for much more than her magic. Cat fights him at every turn, but Griffin’s fairness, loyalty, and smoldering advances make him increasingly hard to resist and leave her wondering if life really does have to be short, and lived alone. I don't usually really enjoy the fantasy/paranormal type of book, but this caught my eye, and I loved it. It kept me entertained and intrigued through every second. Catalia is just trying to keep herself safe and happy. She's been doing well on her own for years when Griffin comes into her life with all sorts of expectations. She wants to resist and hate him, but her heart has other plans. I am completely hooked and am already eagerly awaiting the second book! Don't pass this one up! Award-winning author Amanda Bouchet grew up in New England and studied French at the undergraduate and graduate levels, first at Bowdoin College and then at Bowling Green State University. A Promise of Fire won several Romance Writers of America chapter contests, including the Orange Rose Contest and the Paranormal Category of the prestigious Golden Pen. Amanda moved to Paris, France, in 2001 and has been there ever since. She met her husband while studying abroad, and the family now includes two bilingual children who will soon be correcting her French. 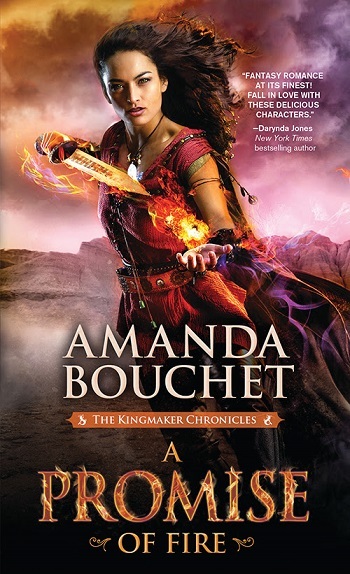 Reviewers on the Wicked Reads Review Team were provided a free copy of A Promise of Fire (Kingmaker Chronicles #1) by Amanda Bouchet to read and review.